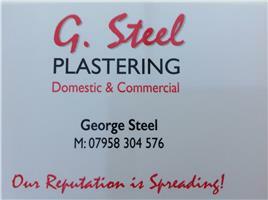 G Steel Plastering - Plasterer based in Timperley, Greater Manchester. G Steel Plastering is a company with over 30 years experience that prides itself on first class workmanship. We provide 100% quality work in all aspects of plastering, internal and external to commercial and domestics clients. Delivering a clean, tidy and friendly service with very competitive rates.